A Dulles Elementary School classroom takes its reading outside to a brand new outdoor reading space. 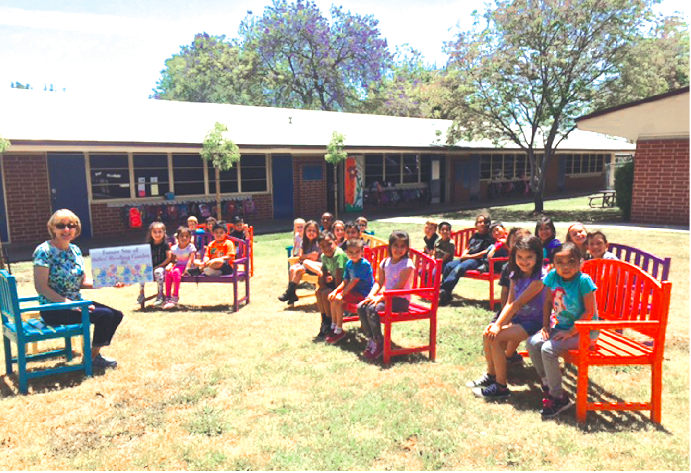 Dulles Elementary and Love La Mirada partnered to build eight benches, a chair and table, and planted three trees to create the reading space. Volunteer community organizations and members joined together to provide Dulles Elementary School with a new outdoor reading space, furnished with freshly painted benches, a chair and a table, and three newly planted trees. Dulles Elementary partnered with the Love La Mirada Project, a coalition of community groups and businesses that beautify the community. When the project reached out to Principal Robin Padget about helping the school, she asked them to turn a grassy area into a spot that engages students and teachers. Love La Mirada covered half the cost of the benches, chair and table, K Kids Club covered half the cost of one bench, and the PTA covered the remaining need. The Dulles Elementary School custodian helped built the benches and the District painters primed them before the service day. Dulles teachers and staff chose the paint colors and bought the paint. Love La Mirada organization members and Dulles staff painted the benches, chair and table on April 30 as a community service project. On the back of the chair is a commemorative plaque recognizing Love La Mirada for its contributions to the project.